At SciChart we focus on speed and performance first. Our charts are engineered to be the fastest possible to allow demanding scientific, engineering and financial apps across platforms (WPF, iOS, Android, Xamarin). Immediately after releasing SciChart v1, we had loads of users report that previously impossible projects were now possible. SciChart Brought the ability to display Big Data and Realtime charts will millions of data-points to the Windows (WPF) platform for the First Time. In 2017, We have developed our High Performance Realtime Charts even further, Our Charts for Windows, iOS and Android are able to draw many millions of data-points realtime. This makes SciChart the Perfect Choice for Big Data, & demanding applications requiring high-performance charts on the Windows and Mobile platforms. // What do customers say about SciChart's Performance? In a recent campaign to solicit reviews from our customers, we were blown away by the magnitude of the response from customers giving us 5-star ratings. Many of the reviews and testimonials mentioned SciChart's Performance. SciChart develops the best WPF Charts on the market. The performance is impeccable utilizing DirectX while minimizing CPU usage. These guys know what they're doing and have a top notch support system. First of all, SciChart is incredibly fast. We have used it for presenting time series at 100 Hz over two weeks, and it is displayed and zoomed/panned well inside acceptable time. Also, the support from SciChart is among the best we have experienced. Before choosing to use SciChart, I created an application for comparing the performance of several available charting alternatives. I measured the performance of single and multiple traces as well as hundreds to millions of points per trace. SciChart proved to be the fastest of those I tested. It also provides a very broad set of features and trace types, making it applicable for displaying results for many types of measurements and data. Using SciChart since several years now. It delivers outstanding performance and the tech support is great. I use SciChart for our WPF application and I feel SciChart is the number ONE chart library in terms of performance, features, usability and support. The library is extremely powerful, high performance and very easy to use, plus it comes with plenty of tutorials to get you started right away. Also, the online forums are a great source of examples in case the tutorials to not cover your needs. SciChart is one of key element embedded into most G&G applications for Oil and Gas. I have used it to display both vertical and horizontal charts with realtime data. Performance is wonderful, it takes almost no time to display ton of data I have. When working on WPF application, SciChart is the least thing I have to worry about performance. It's really a great tool. Powerful and easy to use charting software. Continuously improved and expanded. Very good performance on large data sets. Friendly and helpful customer support. SciChart has the best performance of the charting tools that we've used over the years and it's easy to deploy with lots of examples included with the documentation. Great performance, easy to use, nice graphics, lots of features, I would highly recommend SciChart products to everyone who deal with state of the art charting. Back in 2014 we investigated into more than 10 different WPF charting libraries to replace our existing charts. SciChart already at that time was for us the best solution. Performance, API, feature set and even support are outstanding. Bugs getting fixed very fast without killing the quality assurance (as already seen by other well known WPF library vendors). Performance is exactly what we needed and after testing other products, SciChart performed the best for all our use cases. Great performance and low CPU load, even on high data transfer (~200.000 samples/second). Also very good and intuitive documentation! My company deals with several other component vendors and both SciChart's product in terms of performance/reliability as well as their customer support leave them in the dust. I highly recommend SciChart for any trending applications!! We evaluated several components and SciChart's was the best. Nothing particularly hard about the chart types, we just needed it to render insanely fast, and SciChart's chart did. The technical backup is superb too. Good examples on the website and when you ask an intelligent you get a rapid and expert response. No 'your call is important is to us' here - just a direct line to very knowledgeable people. The WPF suite that SciChart provides is fast, both in terms of performance and productivity. Many hooks provide many layers of customization options, and the service supporting the suite is top notch. SciChart's software works really well, very fast, high quality software. Outstanding technical support. I use SciChart to display ultra-fast, high volume scientific data in a clear and concise manor. We use SciChart's WPF charts in most of our applications and we find the performance excellent. The charts are easy to pick up for new members of the team. It is well documented and the product comes with an extensive example that covers most of the things you'll ever want to do with a chart! SciChart is a very fast and flexible charting library. The support and the given Examples Suite save us a lot of time. Performance matters to our customers, who are using SciChart in scientific, medical, engineering and financial fields to create previously impossible applications, across platforms, on Windows (WPF), mobile (iOS Android) and Xamarin. at performance tests which we have performed. We ship a number of performance demos with SciChart to show you just what we can do. If you want to take a look then get your development team to download our examples for our WPF, iOS, Android and Xamarin Chart Components which contain our performance demos! Draw hundreds of chart series at once with SciChart WPF. In SciChart WPF's Examples Suite, one of our demos shows loading 500 series each with 500 points. The chart loads and displays instantly and can be zoomed and panned without any delay whatsoever! Draw millions of points with SciChart WPF. In SciChart WPF's Examples Suite, one of our demos shows realtime updating of three series up to 10 Million points. The example renders in real-time at interactive framerates. Create Realtime Audio or Spectral Analyzers with SciChart iOS & Android. In our SciChart iOS Showcase demo, we create an app which uses the microphone to read back audio and performs an FFT to show the frequencies in the audio as line chart, and spectrogram, all updating in real-time. The main trace is 500,000 points and sub traces several thousand points. This example is also available for Android. There's more! Have a look at the case studies below where customers of SciChart WPF, iOS and Android have used our high performance charting libraries to create incredible apps using big-data and real-time charting. The University of Illinois departments of Bioengineering, Mechanical Science & Electrical Computer Engineering were researching alternatives to FT-IR for use in Medical Diagnostics. With their innovative Quantum Cascade Laser set up, they generated up to 100 million data points in real time which needed to be displayed via heatmaps. Have a look at our Case Study to see how SciChart helped them create High-Definition images for Diagnostic Tissue Imaging. 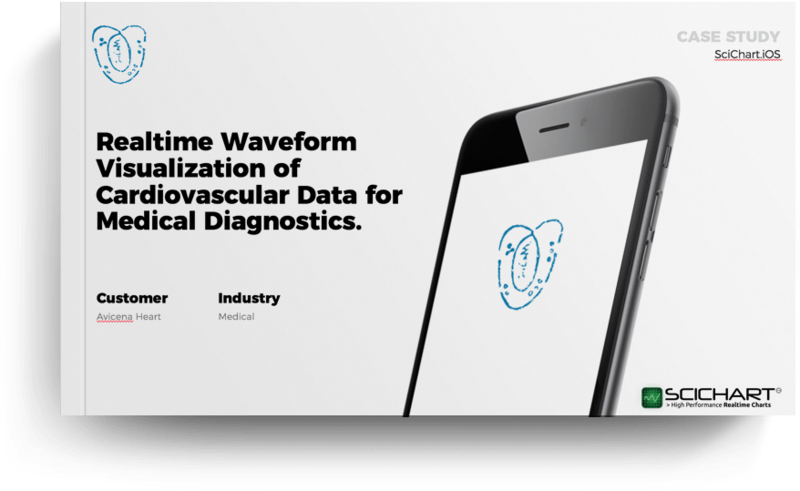 Avicena is a medical device company focused on providing critical information to patients and physicians through their mobile app which works in conjunction with their bespoke proprietary sensor platform the Vivio. The Vivio streams live cardiovascular data directly to a mobile device via Bluetooth to aid in Cardiovascular diagnosis. Avicena needed a reliable charting solution to display accurate Realtime, High-Bandwidth Cardiovascular data in up to 90 series streamed from their sensor device whilst maintaining a smooth UI and allowing for bespoke customizations and annotations. Revolve NTNU Norwegian University of Science & Technology is an independent student organization engaged in Formula Student, Europe’s most established educational motorsport competition.Creating new iterations of their Race Car each year, Revolve needed to be able to visualization their multi-stream, high-bandwidth data from their hundreds of sensors in Realtime to ensure top performance and allow for torque vectoring and testing of their car. Broctagon Solutions, part of the Brotagon Fintech Group is a conglomerate with a specific focus on financial and technological solutions specializing as a brokerage solutions provider. Broctagon needed to render in real time the large multi-stream datasets inherent to the financial and trading sectors. Outputting in several different charting styles such as OHLC and Candlesticks alongside overlaid annotations, tooltips and multiple panes without sacrificing smoothness and increasing the end user experience. A chart component is so much more than drawing lines and shapes on the screen. Across platforms (WPF, iOS, Android), at every step of the way during the rendering pipeline of SciChart, we employ extreme performance optimisation techniques. SciChart employs many novel graphics technologies to achieve it's incredible performance. In WPF (Windows) we mix DirectX Textures and WPF content to work around the bottleneck of WPF drawing. We do the same with OpenGL in iOS/Android and Xamarin Charts. We continue to optimize our charts with every release to ensure that they stay the fastest they can possible be! Our charting software is written by scientific software engineers with a high proportion of PhD Educated / Masters Degree educated developers on the team, in subjects such as Applied Mathematics, Electronics, Signal Processing, Engineering, Computer Science and more. We are experts in performance optimization and thought leaders in cross platform, real-time 2D *& 3D graphics and charting. We have been working on charting full-time since 2012, and the company owner wrote his first high performance .NET charts in 2005! We are the right team to deliver Big Data & High PErformance Realtime Charting to your WPF, iOS, Android and Xamarin applications.